Rated for over 80w output per lamp, 320w per kit. Easy to wire. The strongest kit we sell. Designed for the fastest aging and curing. Will produce a respectable amount of heat, so not suitable for delicate materials. Comes with instruction sheet as this is a modified wiring system, unlike regular ballasts. Still simple to do and doesn't really require more time to accomplish. The diagram below shows the basics. Each lamp has a built in reflector, making design even easier and increasing the UV output up to 50%. Normal lamps (show in left cutaway) shine in all directions. Our built in reflector forces all the reflected energy towards you project piece for faster curing or aging. 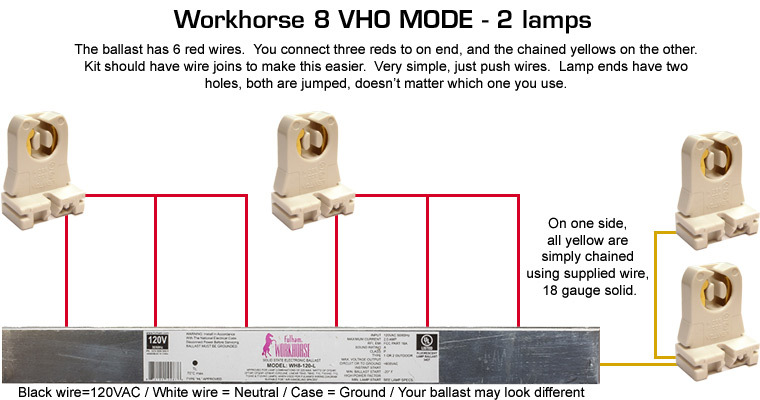 Includes the bulbs, the ballast, the lamp holders and extra wiring to connect the system in VHO mode. Unassembled kit.